After stating that they would give away free tacos if a player in the World Series stole a base, the fast food chain is now making good on their word — and it’s all thanks to Cleveland shortstop Francisco Lindor, who stole second in the first game. 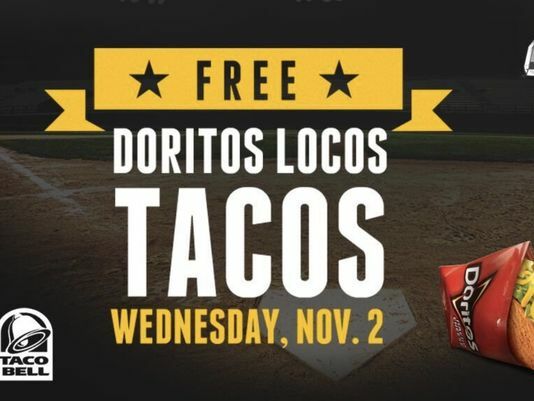 Customers can enjoy their complimentary Doritos Locos Taco on November 2 between 2 p.m. and 6 p.m. as part of their “Steal a Base, Steal a Taco” deal. ELIGIBILITY: No Purchase Necessary. This Promotion is open to residents of the fifty (50) United States and the District of Columbia only. Void in all other territories, possessions, and commonwealths, and all other countries. Void where prohibited. Next post Subway giving away free subs with purchase on National Sandwich Day!!! !